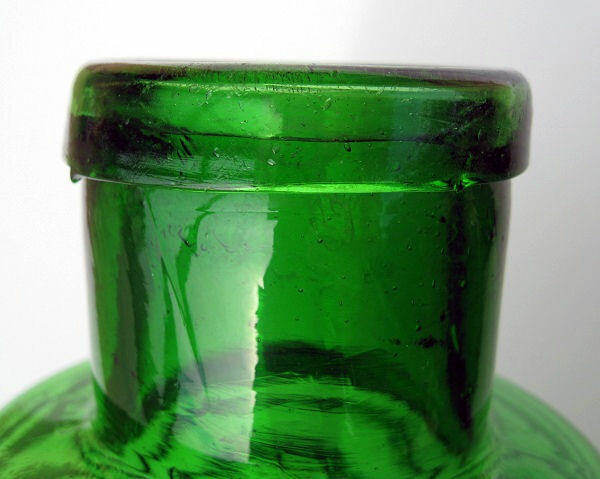 I saw my first one a few years back and simply fell in love with the beautiful, rich, emerald green. 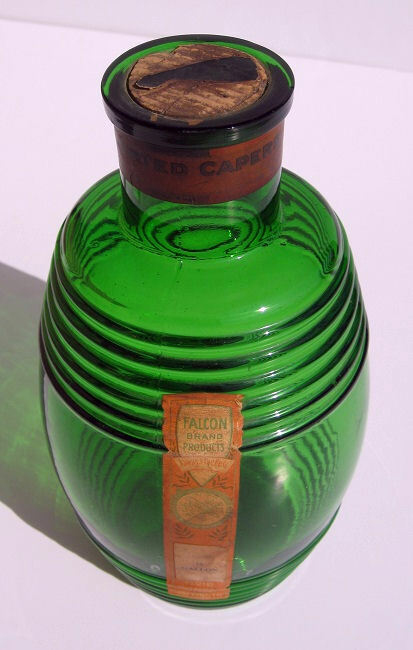 It was in a top lit case in an antique collective and it just glowed. 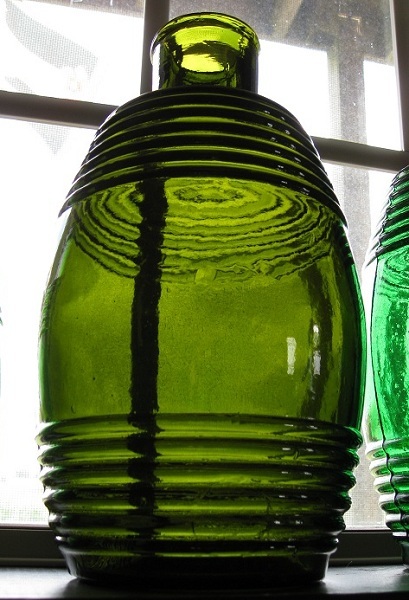 It’s more than just the color; it’s the way the light comes through the shape and ribbing of the barrel form. 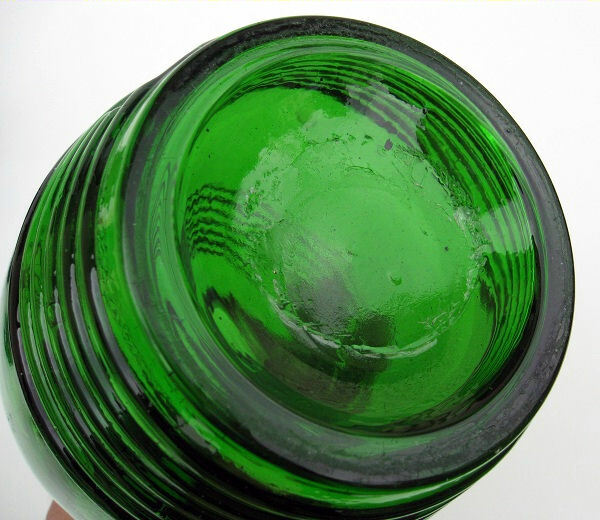 Whether it’s food or bitters, the shape and texture of a glass barrel captures light like very few other figural bottles. 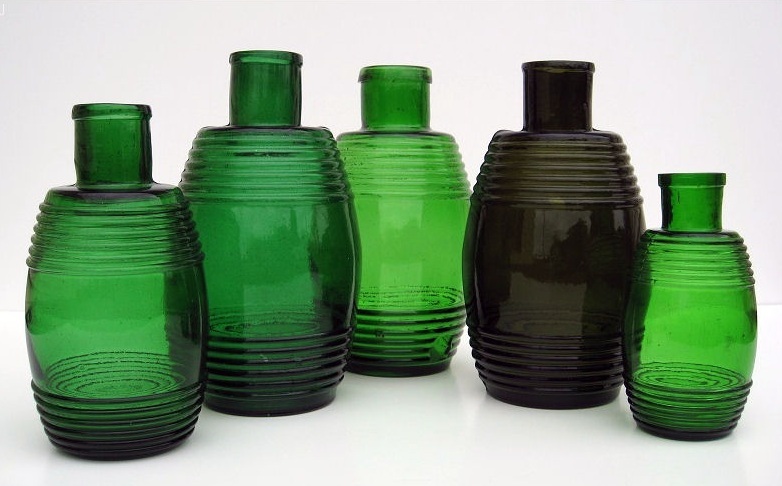 Although I have never seen a bitters barrel from any maker in a true emerald green; most very rare green bitters barrel examples are olive or different shades of green altogether. 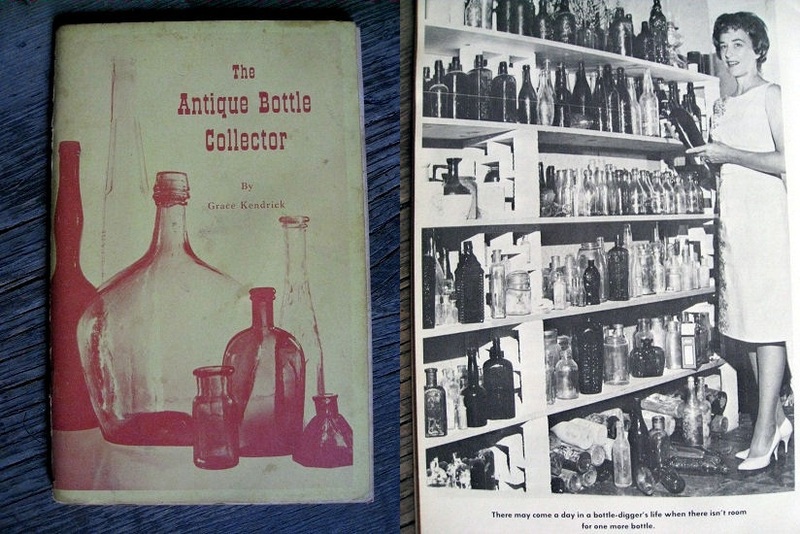 They’re also mentioned by Grace Kendrick in her 1965 book, The Antique Bottle Collector on page 49. 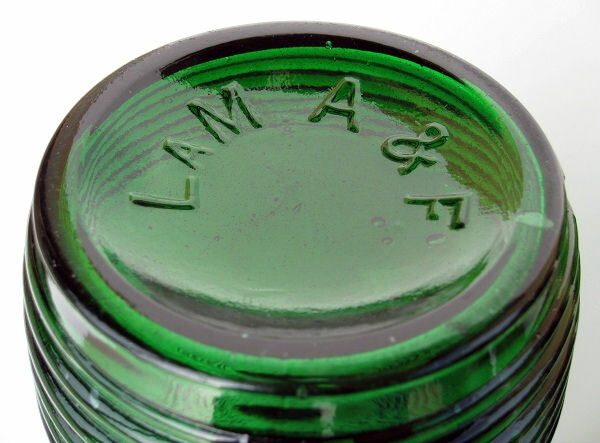 She notes the “LA M A & F” base embossing found on some, but not all examples. She also indicates the pontilled ones are double the value of the smooth based examples. 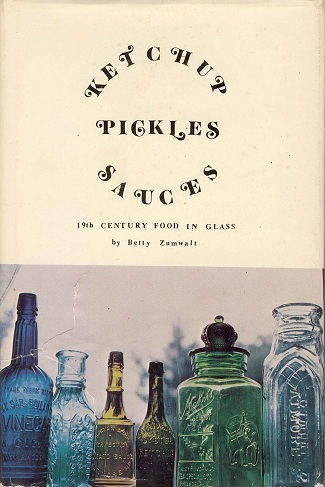 Betty Zumwalt provided the leading clue in her hypothesis. I was really over a barrel on origin until coming across her information. I have found that she is correct and that these are indeed French in origin. From my three years of taking French classes in high school, I suddenly remembered the “LA M” is definitely French; Le, or La is French for the word ‘the.’ (Note the article title, ‘Les’ is the plural use of ‘The.’ Also note the ‘A’ in ‘LA is still capital, but in smaller size, definitely is the French ‘La,’) Some of the unembossed base examples are even pontilled and much older. Shown below is the base of my oldest example and the top of same. 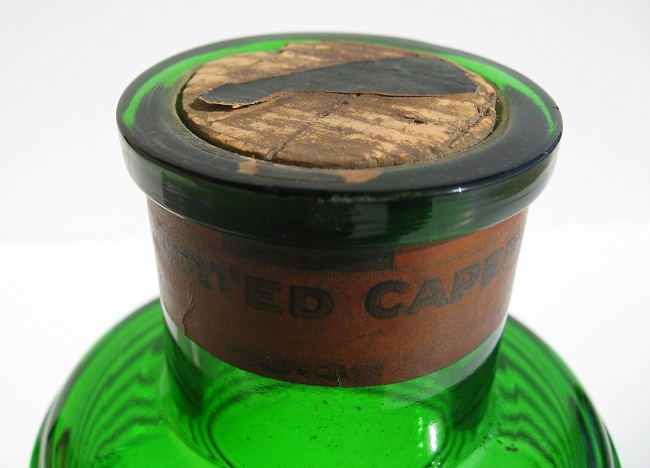 Note the pontil and the much more primitive outward rolled or ‘welted’ lip. I would date this one to the 1870’s or earlier. 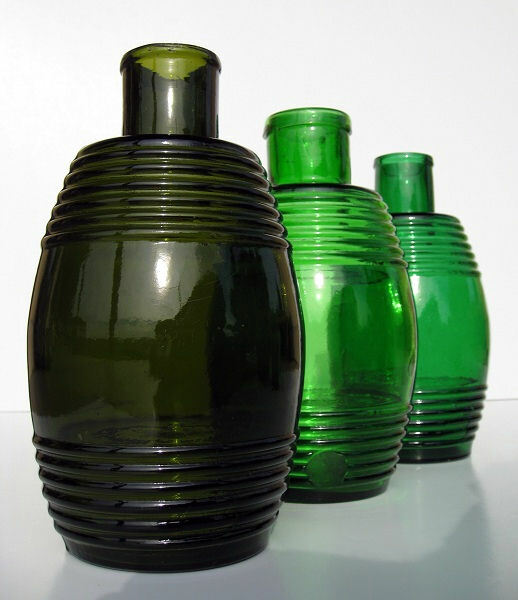 These Barrels were made in three sizes; the largest and most commonly found appears to be a half gallon or just a tad more and measures 10″ high by 5″ wide. 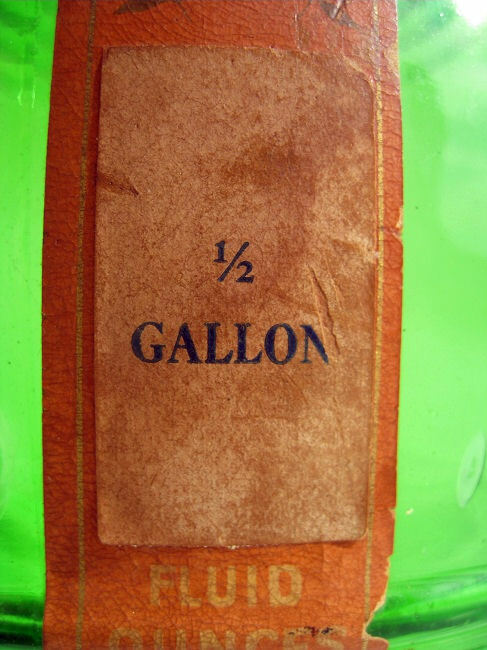 The medium size is a bit harder to find and slightly larger than a quart. It stands 8″ high and is 4″ wide. The very smallest is a real challenge to locate, it took me years to luck across this one. 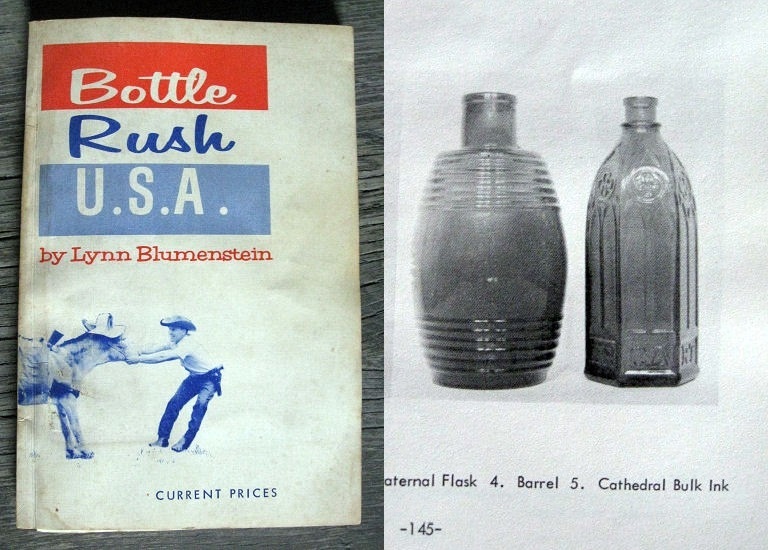 It’s slightly larger than a pint and stands 6-5/8″ high and 3″ wide. 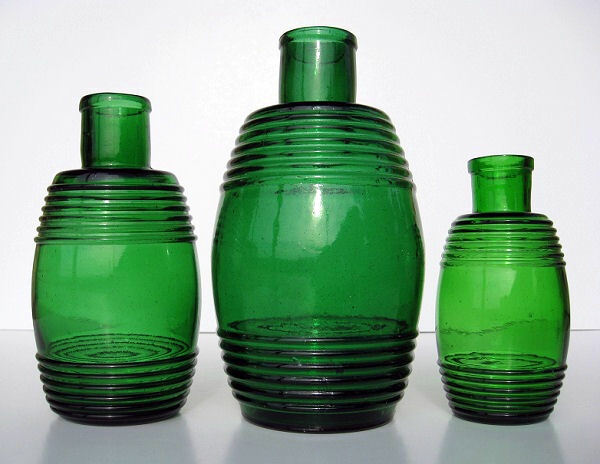 Shown below are examples of the three known sizes. 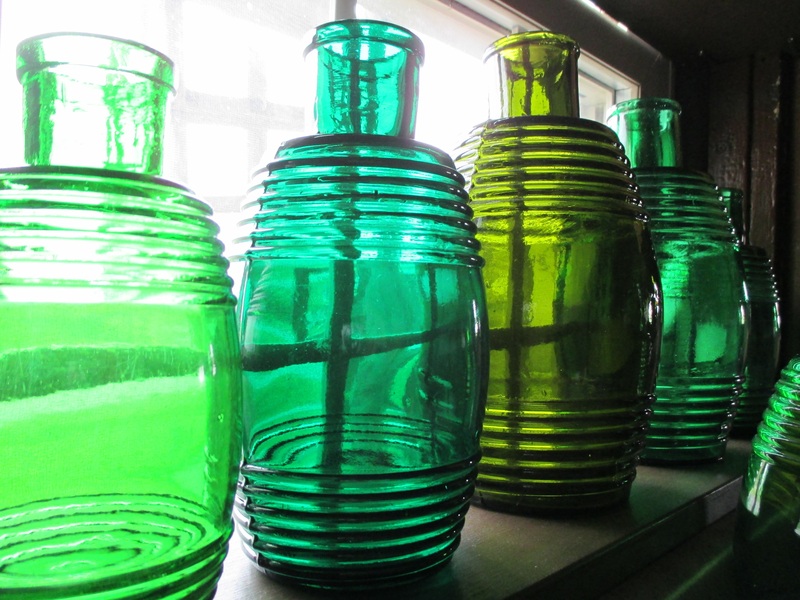 The colors of these run in ranges of beautiful greens; from deep emerald, to grass green, and also a light yellow green. I’ve heard aqua examples exist, but have yet to see one. There is one that really stands apart from the rest and I hesitate to call it an olive type color. The darker barrel is what I can only acurately call “Electric Swamp” or more simply, a yellow moss. I like the electric swamp term because that’s exactly what this example looks to be when the sun hits it. It’s mossy yellow swamp water that lights up electric. See below and judge for yourself. 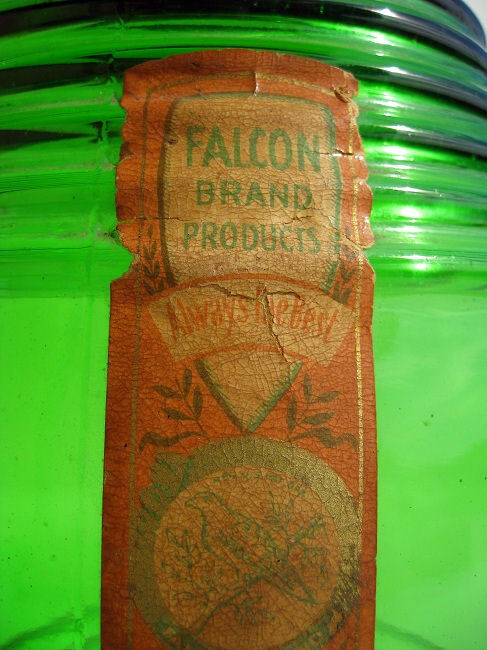 Athough faded over the 100+ years, the label was a deep orange with green and gold trim. 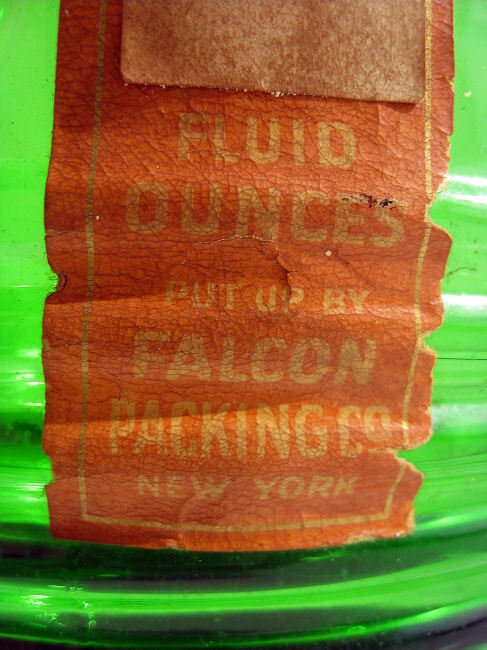 The indicating contents size was actually a label over the original label. 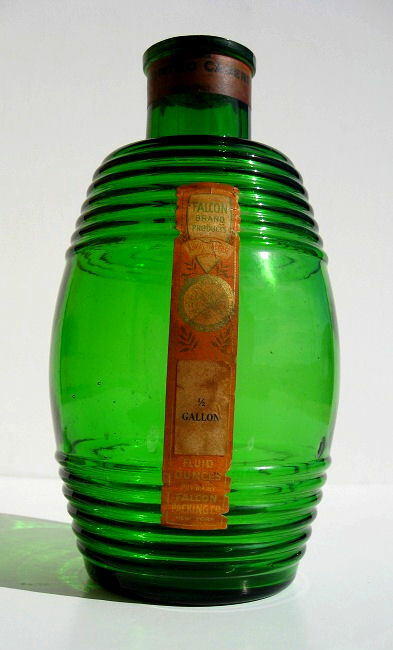 The French manufacturer of the glass barrels is still unknown, but the distributorship is clearly evident on the above labeled example. These barrels held le francais gambade (french capers).